This shirt is white with very fine vertical blue and brown stripes. The blue stripes run in pairs, while the brown stripes are actually made up of dots. It has a left breast pocket with no flap and a V design to the seam at the bottom of the pocket. 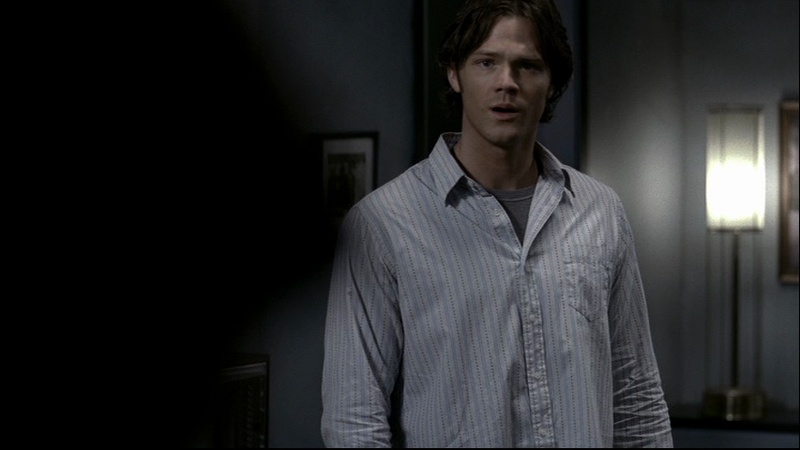 Sam changes into this shirt near the beginning of Born Under a Bad Sign (2x14), after changing out of his blood stained shirt. He wears it for the rest of the episode. In Metamorphosis (4x04), Sam is wearing it when he enters the motel room and tries to convince Dean and Travis that they might not have to kill Jack Montgomery. He wears it for the rest of the episode. 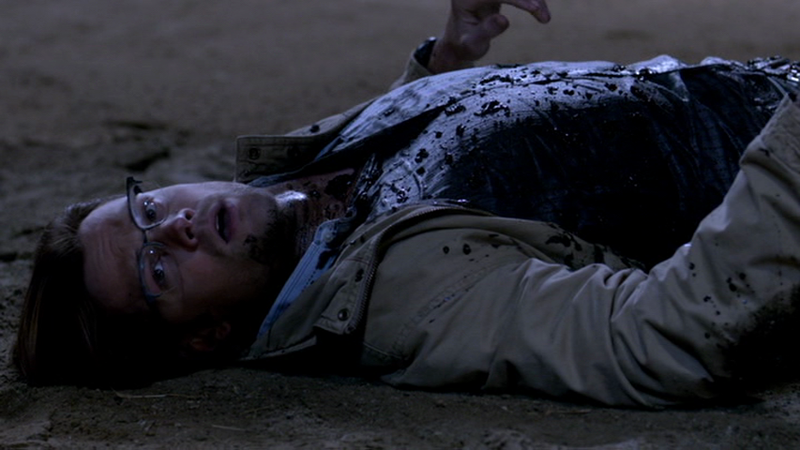 It makes a very brief appearance in It’s The Great Pumpkin, Sam Winchester (4x07), when we see Sam packing into a bag at the end of the episode. In Family Remains (4x11), Sam wears it at least from their arrival at the “haunted” house until the family is saved (with a brief break for suits). In Defending Your Life (7x04), Sam wears this shirt while he talks to Dean beside the Impala at the end of the episode. In Trial and Error (8x14), Sam wears this shirt when the entire Cassity family arrives at their farm after Carl is killed. He keeps it on until he kills the hell hound, but takes it off for the final scene.